Original INFINITI Q60 keyless entry remotes and key fobs at low prices. All Infiniti Q60 smart keys include new uncut key inside free of charge. Save up to 75% on dealership prices. 180-days money back guarantee. We offer the same ORIGINAL Infiniti Q60 key fobs as your local Infiniti dealership. We sell the same Infiniti remote keys. 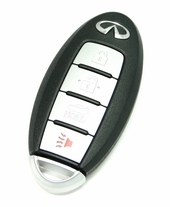 This proximity key fob works only with Infiniti Q 60 Intelligent Key with Push Button Ignition.